Political gerrymandering has almost always been a problem in North Carolina, but new evidence continues to emerge that when conservative politicians drew the current maps (with right-wing godfather Art Pope literally sitting at the table) they took the whole thing to new and historic depths. Read all of the remarkable Monday Numbers by clicking here. A travesty. What can be done ? 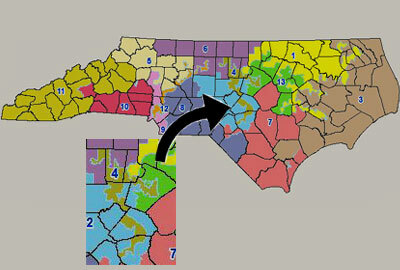 Join us -the NC Coalition for Lobbying and Government Reform- in advocating for the creation of a nonpartisan redistricting system in Nc. “Disaster” is quite over the top….especially when the same concept was a systematic policy by the regressives who ruled NC for 140 years. Good to see the hysterics now, hope to see the conniptions continue when (if?) the radical left wing democrats get to gerrymander again. Oh, and I forgot….I have posted here in the past the radical gerrymandering that took place in the 1990’s and 2000’s as examples, but the current districts look like perfect squares or rectangles compared to the octopi that those radicals came up with. Try reading the 170 pg opinion from the 3 judge panel in the current redistricting case. More precincts have been split almost 10 fold, more county splits and the current districts actually appear more like ink blots and octopi than those of 20 yrs ago. Your understanding of this is clearly conjecture as you hope nobody here extensively read, watched, researched and worked closely with one of three judges during the trial. I have and you are incorrect in your attempt to hide behind the ignorance of others with blatant lies. Yet more LSD TIN FOIL HAT CRAZY TALK. I thought “regressives” was Civitas “wurds of the weak”, last week, no? What is the surprise that so many seats would go uncontested. The current salary for the Speaker of the House and the President Pro Tempore of the Senate is all of $38,151, and the salary of most of the rest of the General assembly is about a third of that. Is it any wonder that only rich old men run for office at all? And who do you think are rich old men? Democrats? Yeh, right!